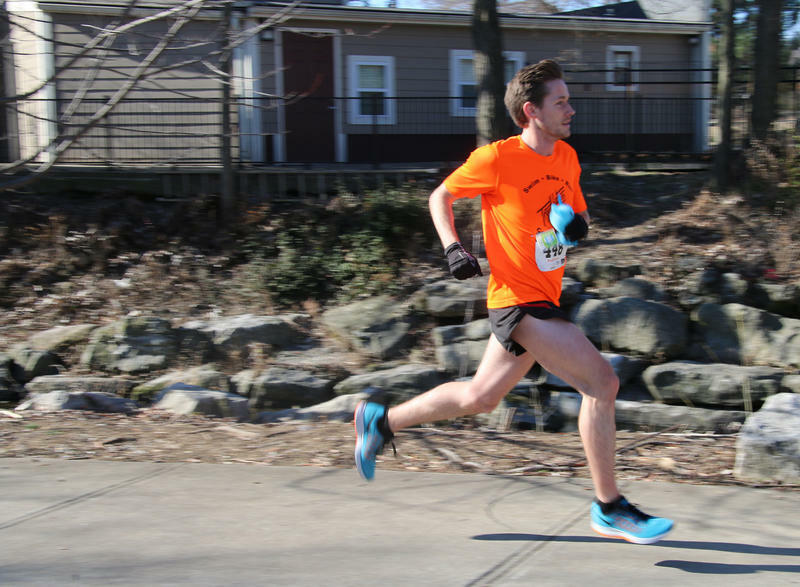 Nearly 100 runners and walkers came together Saturday morning for the annual True Life Run during the True/False Film Festival Weekend. 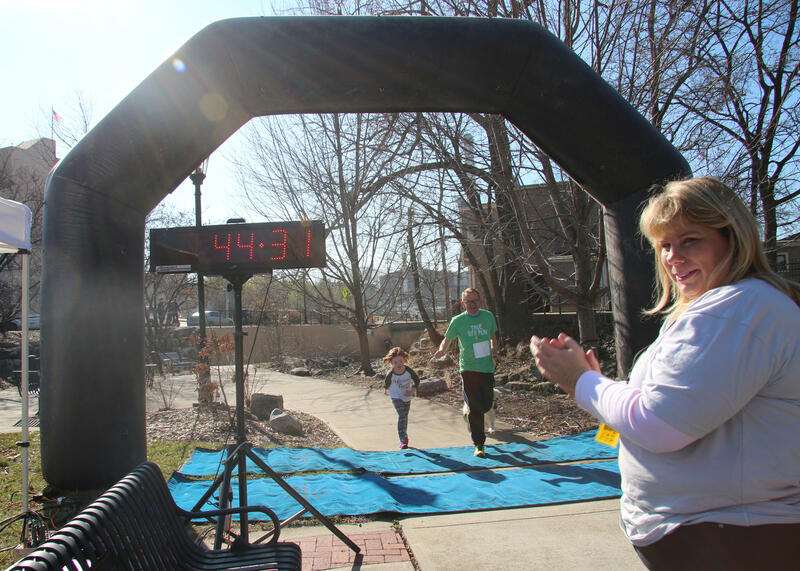 The proceeds from the 5k went toward the True Life Fund that is presented to a film protagonist each year, and this year’s recipient was Sonita. Patrick Henson, one of the race organizers, said he estimates the 5k raised about $3500 this year. During the event I spoke with runners, walkers, volunteers and those gathered in support of the participants. Candy Kudnert and her 2- year-old grandson Ezra Burden, as well as Ezra’s mom Ashley, spent part of their Saturday morning waiting at Flat Branch Park for their runner, Mike Burden, to finish. Mike is Candy’s son, Ezra’s Daddy and Ashley’s wife. He’s run the True Life Run for several years. 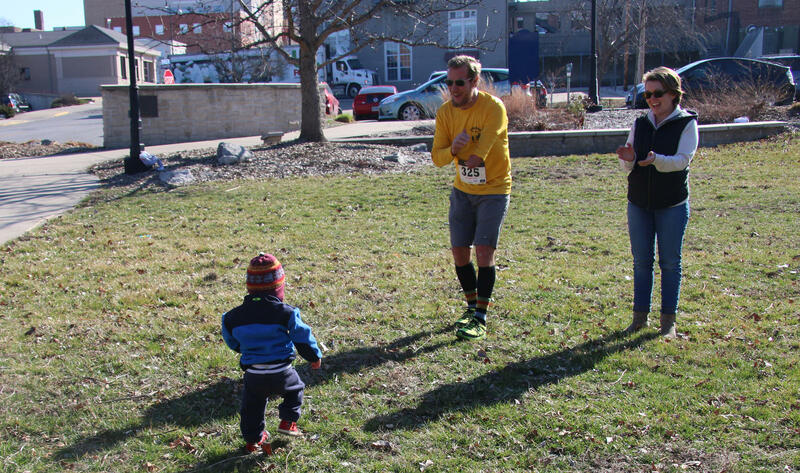 Ezra was disappointed that he wasn’t running with his Dad, like he usually does, but seemed to be preoccupied with the idea of going through the inflatable finish line. “I go through that tunnel. I go through that tunnel,” Ezra said. Ezra’s Dad, Mike, ended up coming in second with a time of 19:15. He said while he wasn’t fast enough to win this year, he has in the past. Sarah Jane Kerwin was the female winner of the True Life Run. Sarah Jane Kerwin was the first female finisher and fourth overall. She finished in 20:31. She says she’s been coming to True False for years, but this was her first year doing the 5k. 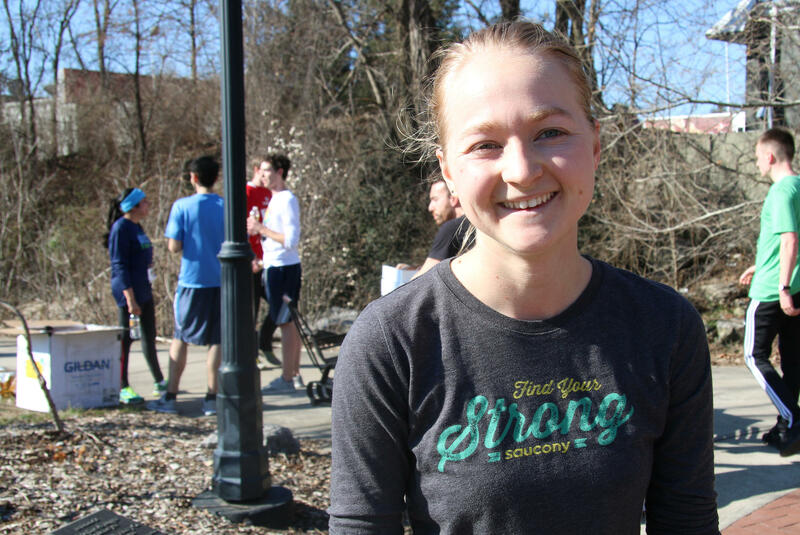 She says she enjoyed the challenges along the course, which included climbing nine flights of stairs in a parking garage, playing hopscotch and carrying an egg on a spoon. 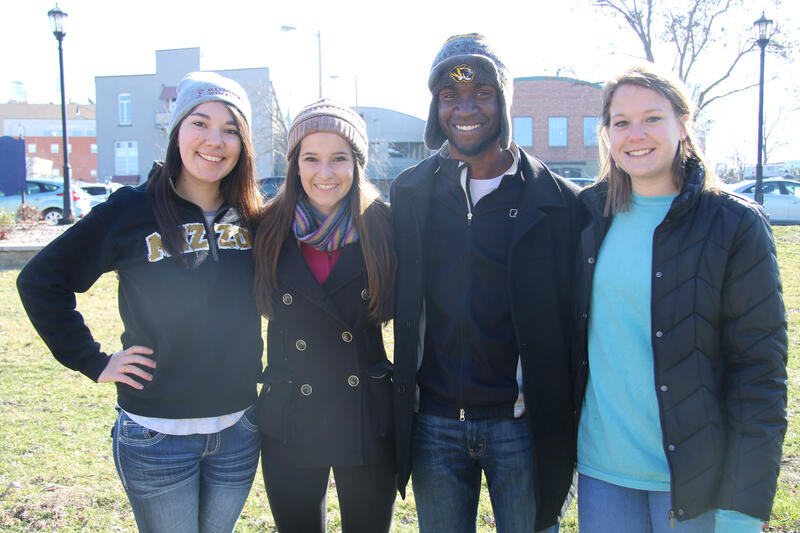 Mizzou students volunteered at the event. Some student with the Mizzou Student Union United Way volunteered at the event. Each of the four students said they really enjoyed motivating the runners. The students said that perhaps next year they’ll lace up their running shoes themselves. For some at the 5k, like Rosie Clement and Andrew, it was a family event. “My whole family is here. We've got my wife and my daughter Beatrix and son Vincent that are on their way,” Andrew Clement said. Rosie Clement and her father ran the True Life Run together. Andrew says he likes contributing to the True False Festival, but due to his family commitments – three kids and two dogs – the 5k is really the only way the family can get involved. “We don’t get to go to any of the films, but at least we get to bring everyone out for a run which is good exercise and we get coffee and donuts at the end of it,” Clement said. He added that maybe next year, he and his wife will get a babysitter for the festival. Alicia Webb and Yajie Yu are both fourth year medical students who came out to enjoy the day. 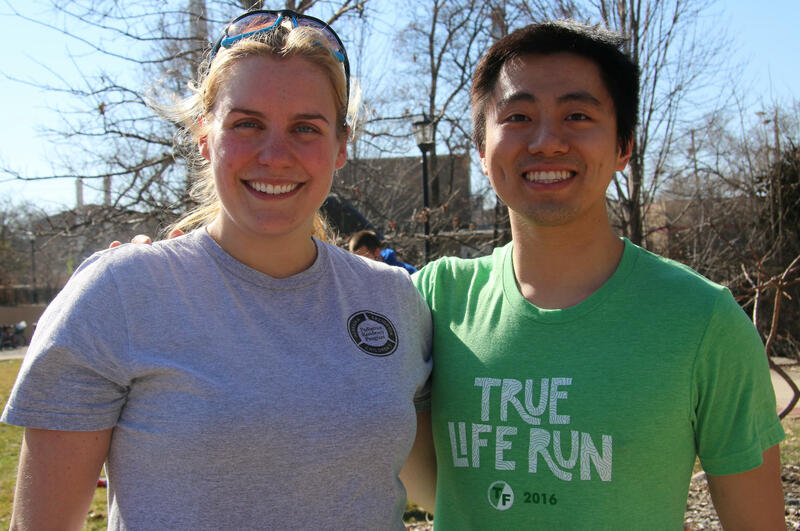 Yajie Yu and Alicia Webb are both fourth year medical students who ran this year’s 5k. “It just sounded like something fun thing to do on the weekend, and it was supposed to be a nice day so we figured it would be a good way to get started early on True/False,” Webb said. 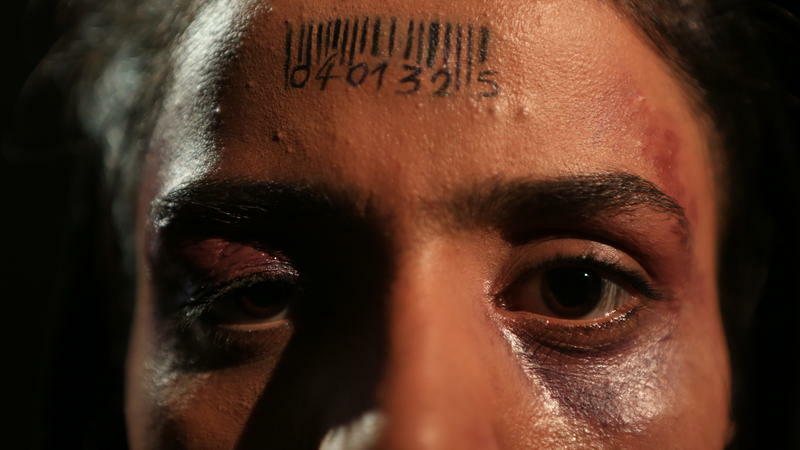 The film "Sonita" follows the life of a young, passionate Afghani refugee living in Tehran, Iran, who dreams of becoming a rapper, but faces many challenges – including her status as an undocumented immigrant living in Iran and her mother’s plan to sell her as a child bride worth $9,000.